Vacation and a Week Away from Training- Sabbath. After worship tomorrow (10:15 am at Pennington Presbyterian Church! Come on out) I am heading out for a week away with the family. I have had a busy and full summer. Mission trip to NYC working with urban ministries and immigration advocates. Amazing week! And a Footsteps of Paul tour to Greece and Turkey with a group from our church and a couple of other local congregations. Thrown in a few funerals and pre wedding counseling, all while managing some autoimmune stuff, I’m pretty exhausted. I don’t like to miss training, but my body is telling me to take a break too. My finger is healing alright but I have aches and pains all over. I haven’t had a stinger in over 25 years. I had a couple playing football when I was younger. I got knocked in the head today during training. Not terribly hard, but I saw stars and had an instant headache. As I stood up for the next skill I started to feel nauseous and my left arm went totally numb. I finished the class and decided not to do live training. So, as much as I love training and especially live training, the 46 year of couch warrior is taking a break without feeling like I’m missing out. I love this perspective. Even earlier this summer when I missed time due to travel and work I felt like I was falling behind and missing out. This time I’m kind of excited to let the body heal a bit and come back with a bit of renewal. I guess this mirrors the idea of sabbath. I love the people at my church. I spent my day off playing golf with two guys from church who are key our church being a place of welcome and I had so much fun. It was a gift to be included in their days off and I left the course energized. I usually do not say yes to things on Fridays but I’m so glad I did. Even with such life-giving experiences I am glad to be taking a week away. I’m tired physically and emotionally. I can’t wait to laugh and play with my kids and have great conversations with my wife. And to break away and listen to God in a different rhythm. Sabbath. If I can get a little preachy… I would say to people: work hard. Do things that challenge you and extend you beyond your places of comfort. Serve others until you get tired. And then break away for time to rest and listen. This rhythm of work and rest is a sustainable rhythm. It brings life and growth. Once again my time in the mats informs my life as a pastor! Thanks BJJ and Thanks be to God for every good and perfect gift. I had a first yesterday. I almost threw up on the mats. I had an epic day BJJ wise. I squeezed in a lunchtime class, in between writing a sermon and going over notes for a memorial today, I helped out with an evening kids class and I got 3.5 rounds of live training in. I was unsure if I was going to make it back for the 9 pm live training so I ate a bowl of pasta at 7:30- big mistake. I did make it back. I jumped in for the last live part of the advanced class and then rolled for three solid rounds. The intensity of the rounds were pretty high and I loved them. I rolled hard with Andre, Frank and Coach Wojtek- three guys who are really, really strong, technical and athletic. Each round offered some great training. Then I moved over to roll with a Kyle. 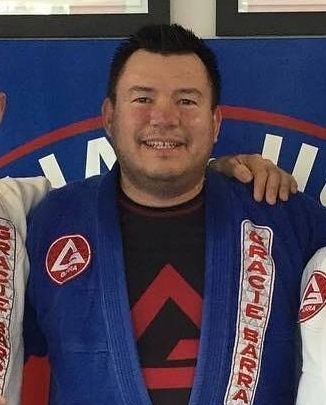 He is a recent blue belt promotion and has a wrestling background. Great guy, great training partner. He is also quite a bit smaller than me, although really strong and really fast. We rolled hard scrambling for position and being pretty even. He made some great technical moves and tapped me. As we began again, I started to feel a fullness in my stomach, which I totally ignored. We worked for position and then all of the sudden Kyle clinched. As I was in his grip and I was beginning to exert, I felt the panic of starting to lose my dinner. I clamped down hard and tapped immediately. And then I shut it down. I was done for the night. It was a VERY close call!! So, I experienced my first submission by digestion!! Glad to have spared my training partners the grossness of barfing all over and the shame of being a hurler!! No. I can’t really find BJJ in the Bible. Except for Genesis 32 where Jacob wrestled with who he later discovers to be God. Jacob dislocated his hip- likely from a vicious, Danaher-inspired ashi garami. But he didn’t submit. Ego. You will have to go read it to hear the rest of the story. It’s pretty good. No. Learning BJJ is to me, similar to learning Biblical Hebrew. It is painstakingly difficult and you feel like failure is the only consistent thing about it. But every now and then you realize that you are learning and the foundation of the language, and the sport are building. You know enough of the base level to begin to see how powerful the variants are. In Hebrew you barely learn the rules before you realize how often the linguists and authors break them. In BJJ it is a little more fair. I learned a variant that gave me an “A-ha” moment yesterday. We were learning skills to take the back of your opponent or partner. Instead of the immediate move to seat-belt into a collar choke, we practiced controlling with under the arm Gi lapel controls. It was amazing. I realized that I had drilled the seat belt enough that it had become my natural movement. Not only offensively, but more importantly defensively. I immediately covered to protect from the choke when my partner took my back. That automatic response is exactly what opened me up to be effectively controlled by the lapels. I celebrated two things and took one deep sigh of resignation. Celebration #1- I had practiced something enough that I did it without really thinking!! Celebration #2- I was gaining a really new effective variation skill. Resigned sigh- how would I be able to think and react in real time without getting paralyzed by the variations?!? I will have to worry about that another day. I choose to celebrate! There is a new BJJ gym opening up in my area. I’m really excited to see the sport grow and be offered to more folks. Grace Barra North Princeton is set to open October 1, 2018! There are some great deals as they look to build a base in the North Princeton, Kingston, Skillman area. Check it out. Coach Wojtek is taking in the role of Head Instructor. We will miss him at GB Princeton for sure, but he will provide a rock solid base for great Jiu Jitsu instruction at the new school. Feel free to hit me up if you have any questions. My first Brazilian Jiu Jitsu class was August 5, 2017. What a gift it has been. I’ve made some new friends. I weigh 26 pounds less. I have tackled some challenges in my life with a new sense of empowerment and grace. My ego is healthier now than I can remember. A gift. That is how I describe this BJJ journey. This week I started assisting in the kids classes at Gracie Barra Princeton. It was really fun to see kids take in the instruction from Coach Turtle and Coach Wojtek. And it was fun to offer what tips I could too. I also learned a lot from seeing how each child learned differently. How you could say the same instruction to 3 different kids and they would all hear it slightly differently because they are different. Difference is a good thing in Brazilian Jiu Jitsu. You develop your own style because you feel and react differently to each movement. I also saw that some students both adults and kids-including myself, don’t listen very well. Distraction, focus and attention to the instructors and coaches varies for each student. This really makes a difference as you are learning something new. I am hoping to squeeze every ounce of knowledge from my coaches and training partners. So watching other students manage their different learning styles is informing me to be more aware of my strengths and weaknesses as a student. Nd preparing me better to enter the mat with more intention. The mats are a rich place to learn. As an adult or a child we are all capable of gaining skills and knowledge. The great thing is in BJJ, in my experience at Gracie Barra Princeton, you get to learn within great mentoring relationships. I have developed a trust in my coaches and my training partners. And I am building trust in myself as a student, partner and coach. So, another great week. Thanks to all who were a part of it. And thanks to Coach Mike, Coach Turtle, Coach Wojtek and all the kids and parents for trusting me to join them in their BJJ journey.